6-mercaptopurine is an antineoplastic agent of the following pharmacotherapeutic group: antineoplastic agents, antimetabolites, purine analogues (ATC-Code: L01BB02). Xaluprine® contains the active substance 6-mercaptopurine. It interferes with the metabolism of tumor cells, inhibiting their growth. It is used to treat a form of hematologic cancer in adults, adolescents and children. 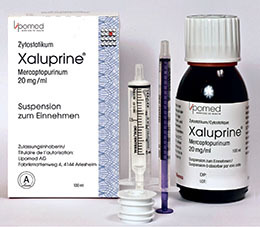 Xaluprine® (mercaptopurine 20 mg/ml oral suspension) is sold only in Switzerland by LIPOMED.